Look for the Proudly Wisconsin Badge when shopping for cheese. Any brand of Wisconsin Cream Cheese or Mascarpone can be used in this recipe. Combine the pumpkin, cinnamon, ginger, nutmeg and 1/4 teaspoon salt in a small bowl. Beat the mascarpone, cream cheese and remaining salt in a separate large bowl. Add pumpkin mixture; beat until blended. Add the sugar, flour and vanilla; beat just until combined. Add egg yolks, one at a time, beating well after each addition. Set aside. Heat oven to 325°F. Line a greased 9-inch square baking dish with parchment paper; grease paper. Beat the butter, sugar and vanilla in a large bowl. Add eggs, one at a time, beating well after each addition. Combine the flour, cocoa, salt and baking powder in a separate bowl; gradually add to butter mixture. Fold in chocolate chips. Spread half of the brownie batter into prepared pan; drop spoonfuls of reserved cheesecake mixture over top. 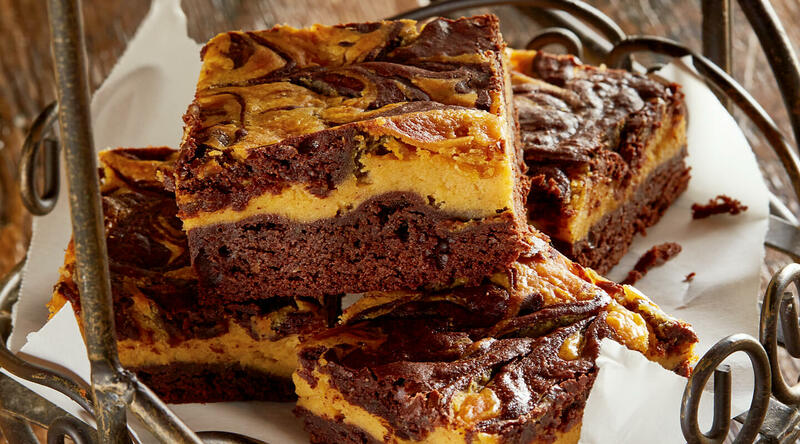 Spoon remaining brownie batter into four lines over top of cheesecake layer; swirl batter with a toothpick or knife. Bake for 43-47 minutes or until top is just set and a toothpick inserted near the center comes out clean. (Do not overbake.) Cool on a wire rack. There are no preservatives added to Wisconsin mascarpone. It’s a buttery, fresh cheese, that’s meant to be eaten soon after it’s produced.